Already decades ago the farms in South Tyrol opened their doors for guests to taste the wine and typical peasant dishes were served at the tavern. The word Törggelen derives from the Latin word "torculum", which means press. Therefore the wine press is called by South Tyrolean "Torggel" or "Torkl". We are happy to welcome you here in the traditional Törggelen Raas. The wine, which we will serve, among other homemade products, we produce with grapes from our 1.2-hectare wine estate, located above Brixen in Eisacktal. Moreover we spoil you with home-made South Tyrolean home cooking: ravioli, spinach and cheese dumplings, homemade sausage, salt meat, pork ribs, sauerkraut, fried potatoes, fritters, chestnuts, bacon and much more. We place special emphasis on producing these South Tyrolean specialties made from local produce. 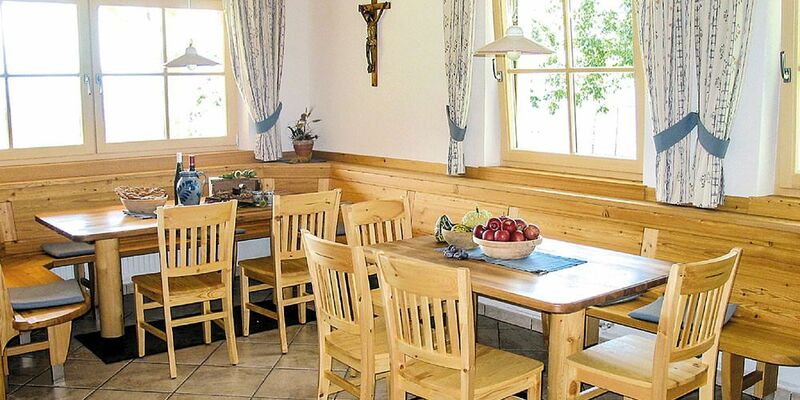 In our cozy Törggelestube 50 people can be hosted, further 50 visitors can enjoy splendid views over Brixen and the Eisacktal on our sun terrace. While you enjoy magnificent views over the Brixen basin and the wide South Tyrolean mountain scenery in the midst of orchards and vineyards, our younger guests can let off steam in the playground. We look forward to seeing you soon in Raas as a guest of our cozy tavern. You can reach us by car from Brixen, driving towards Elvas and turning on the left at the right-hand bend before the village (direction Raas). Coming from the north, take the road which passes in the industrial zone of Schabs, and follows this up to Raas. The Trinnerhof is at the end of the village towards Brixen. By good weather the Trinnerhof is recommended as a starting point or an intermediary stop during a picturesque circular route through the apple-plateau Naz / Sciaves (Dörferrunde). Here you can also pay a visit to the biotope Raier Moos in Raas, nature trail included. All year long we offer accommodations in five guest rooms and an apartment. In summer and autumn with its central location Raas is an ideal starting point for hikes in Eisacktal, on the Plose, the Puster Valley or the Vilnößer Tal. In winter the ski bus stops right outside our front door and takes you to Gitschberg ski area or on the Plose. By car, the ski resorts Ratschings Jochtal and Kronplatz are easily reached in a short time.